WA pork chops are always a favourite when they are on the menu. 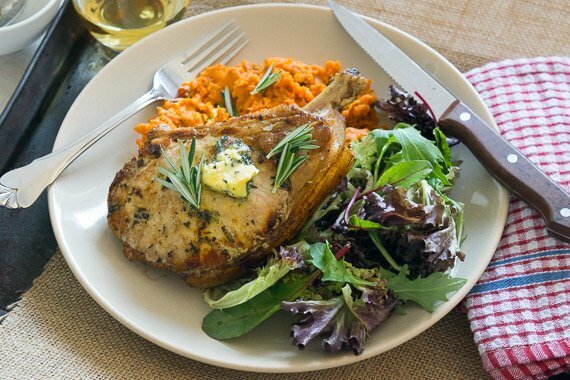 Today, you will cook your pork in rosemary and garlic butter, then, when it's juicy and tender you will serve with a simple and healthy sweet potato mash. Don’t forget to share the moment #youplateit on Facebook or Instagram! Remove butter from fridge. Preheat oven to 220°C. Peel sweet potato and cut into 1 cm dice. Place in a large pot, cover with water, and season generously with salt. Place over high heat and boil until tender, 8 - 10 minutes or until tender when pierced with a fork. Drain and set aside (for step 4). Wash the fresh produce. Finely chop the rosemary leaves. Mince garlic. In a medium bowl, combine chopped rosemary, minced garlic and butter. Pat dry pork with paper towel. Season pork with salt on both sides then spread over rosemary butter, reserve about 1 tsp. Heat a large ovenproof pan over medium-high heat. When oil is just smoking, add the pork, buttered side down. Cook until just browned, 2 minutes per side. Transfer to the oven and roast until well browned on the outside and slightly pink inside, about 4 minutes. Remove from pan and allow to rest for 5 minutes. Add reserved rosemary butter and milk to the pot of cooked sweet potato. Mash until smooth. Season with salt and pepper to taste.